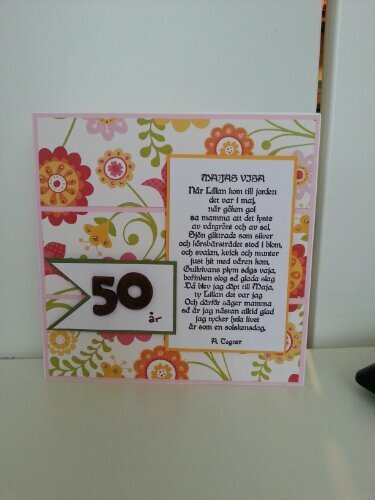 My mom asked me to make a card for her old friend who turned 50 the other day. Here’s the result which was based on a sketch challenge but I was too slow entering so it’s closed. 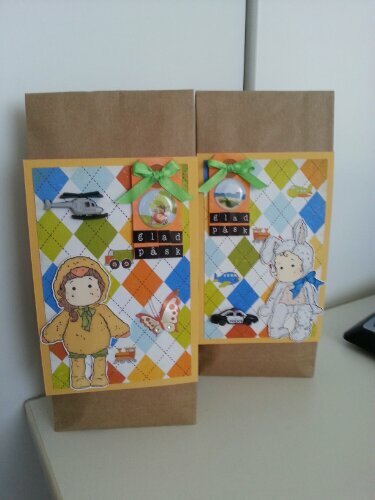 But it doesn’t matter, I like the card anyway and it was fun to make! I wanted to use something close to nature or cows as she is a farmer who has a lot of beef cows (?). 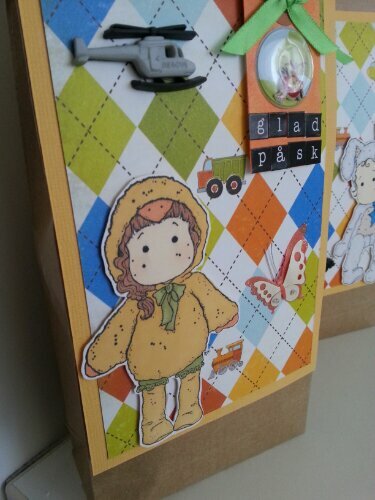 Unfortunately I had no fitting stamps for that nor did I have cow patterned paper or anything like that. 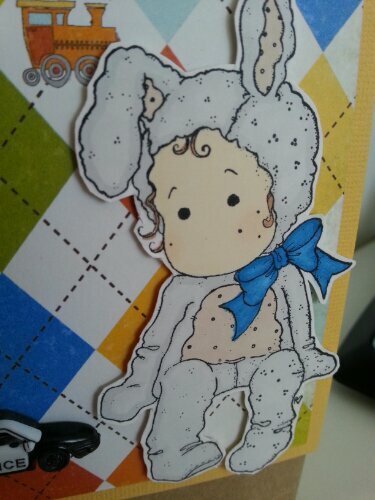 Instead I went for pale natural colors and my mom got to choose the patterned background paper! Still practicing on coloring blonde hair, it’s so much easier when you know which colors to use and how. Thank you youtube! 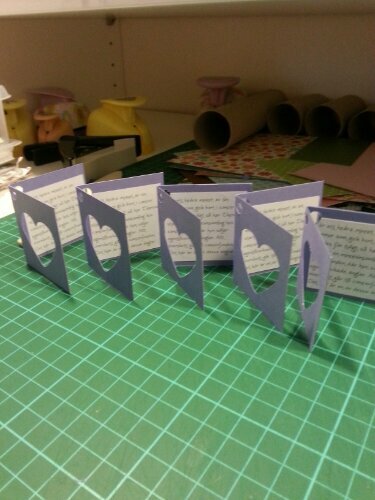 I recently purchased a new cutting tool, a guillotine cutter from Tonic Studios and I haven’t really used it yet until last Friday when I decided to cut my 12×12 papers into 6×6 instead. I never make any layouts, it’s just cards and other smaller projects and I very rarely use 12 inch papers for that, it kind of scares me to cut a tiny piece from one of them. I started by sorting out all the simple patterned papers and those with smaller images that were meant to be cut out (I suppose?). 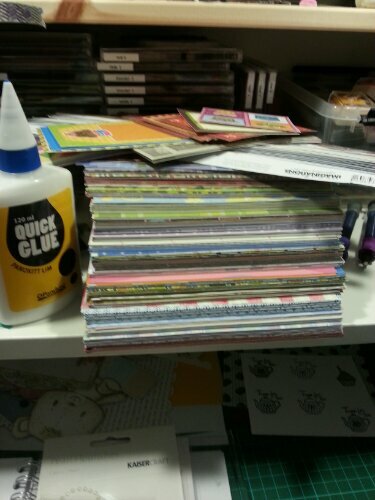 This pile is like 1/3 of my collection, those I kept are more basic paper, great for card bases and backgrounds. I found no need to cut these too. 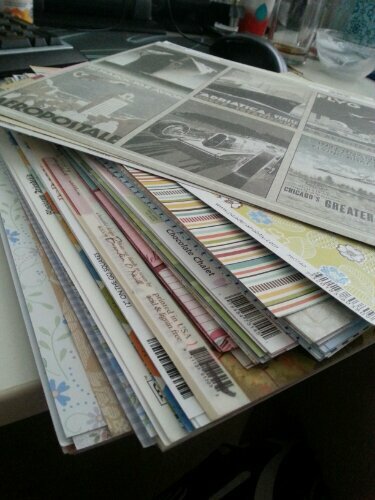 This almost doubled my existing collection of 6×6 and I realized I need a few projects badly. 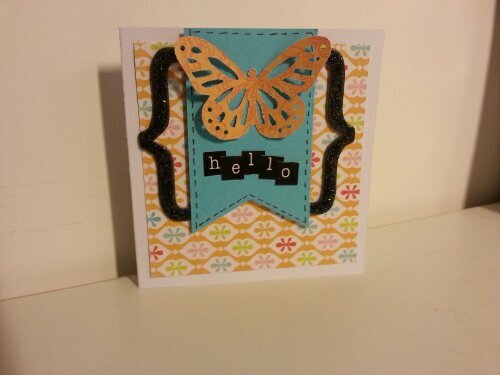 I managed to make two cards this weekend and I got to use a few of my newly cut 12 inch papers and other stuff in my stash, a few new ones I got from a sell out. Awesome! This morning I made another card inspired by one of my cut papers, it’s a transparent/vellum like paper with some flowers and fruit and I got to think of my new magnolia stamps. 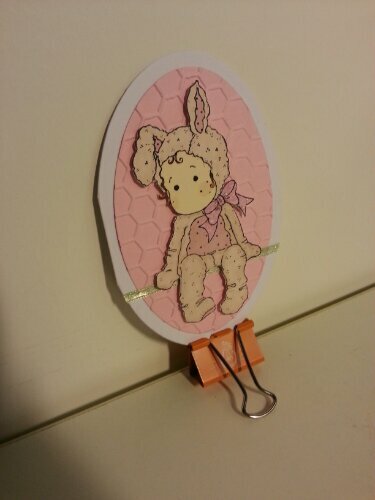 I got to use one of my new prima flowers and wooden embellishments. 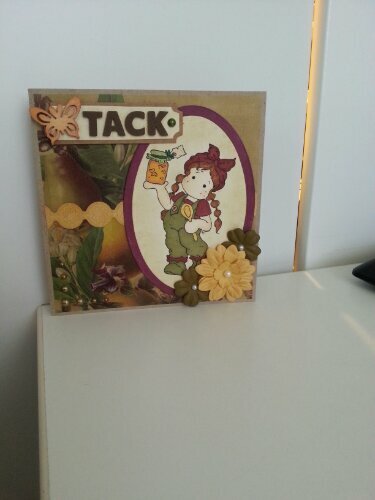 I also used another piece of one of the border stickers I purchased. I’m such a mindless shopper! I made the card for the current Magnolia challenge which was to use a Magnolia stamp and vellum, perfect for my rediscovered paper! My mother turned 50 about a week ago and threw a 60’s/70’s themed party. She encouraged her guests to wear something reminiscent of the 60’s or 70’s, a hard task for someone who was born in the middle of the 80’s if you ask me. I spent hours and hours googling, asking around, googling some more and collecting inspiration from everywhere I could find it. I watched movies, searched for celebrities from that era and watched a documentary about Abba. I visited a bunch of stores to see what they had to offer (I don’t like second hand items from unknown people so I didn’t visit any stores of that kind, silly, I know). Unfortunately the current trends seems to be too much 80’s, might have worked if I aimed for a really late 70’s look. 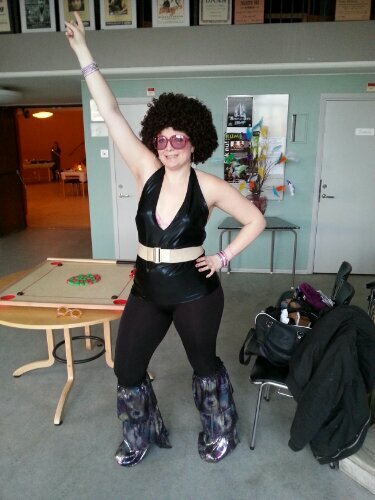 Since I completely missed that you were “allowed” to wear clothes from the 60’s too my focus was a 100% on the 70’s and after a while I decided to go for the disco look. I’m not very fond of the hippie style that ruled both the 60’s and the 70’s. I’d rather go for the trends of the 50’s if any, which I suppose also appeared in the early 60’s. Anyway, I bought a slightly 60’s/70’s inspired dress as a backup if my upcoming plans didn’t work out. I started sketching on a suit with tights legs and wide cuts, lots of glitter and shiny materials. 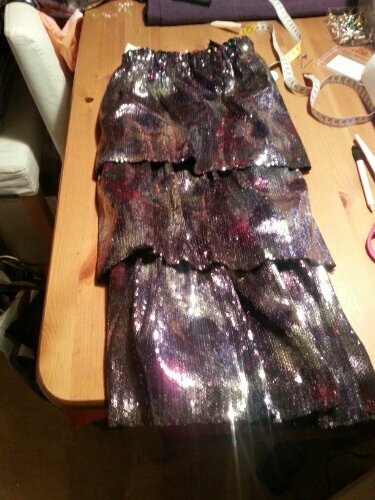 After some research I decided to go for a deep halterneck top in a shiny fabric together with my sequin ruffled flared legs (is this even a proper name for them?) and the cherry on top: the afro wig. I had some glasses and bracelets at home and I also happened to have this wide, golden belt and large earrings. It couldn’t get any better than this! The shoes might have been the least 70’s inspired part of my suit but at least they were looking like a combination of sandals, clogs and plateau shoes. The fabric hunting was also interesting, I happened to find the sequin fabric in a store i Östersund while on a customer visit for work. I was worried that I didn’t buy enough for both flares and a top, so I found a shiny fabric here in Stockholm which was just perfect for what I had in mind! The pattern I used for the top was a combination of two Burda patterns found in two of my magazines I still keep from 2006 and 2007. I used to have a subscription on that magazine for a few years and I still keep all the issues and the random ones I still buy every now and then. One of the patterns was a halterneck top and the other a tank top with a deep neckline, it is a bit big and the fabric quite stretchy but it worked fine for one night. When I was finished with my clothes for the evening my last challenge was the make up part (soooo happy I bought a wig and didn’t have to think about the hair too) which didn’t go exactly as I planned. Youtube and google told me pastel colors, eyeliner and orange lips were the trends of the 70’s. Lavender eyeshadow, thick cat eyeliner, pale pink lipgloss and fake eyelashes. And of course: glitter and shiny eyeshadow as a highlighter all over the place! It was decent but I was disappointed with the colors. I should have used more eyeshadow to make the color pop but I mostly used the glasses anyway so it doesn’t matter that much. Right before the party I watched a few dance tutorials on youtube for the John Travolta dance from Saturday night fever and picked up a few funky moves. It was awesome. Here’s a picture of the outfit for the evening and one where you can see the makeup slightly better. A closer image of my fake flares. I didn’t sew complete pants, just the flares and put some elastics on the top to make them stick right below my knee. I just wore a pair (or two, it was cold) of shiny leggings and put them over my shins. I just have to show you the decorations for the party. 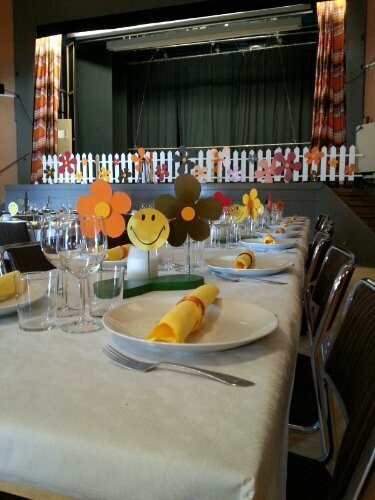 My handy mother and husband made the fence with flowers and the table decorations! 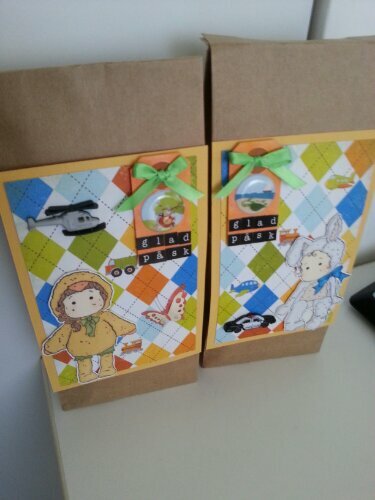 I helped her cut the smilies with my Big Shot, the other decorations are made of some sort of mdf board. 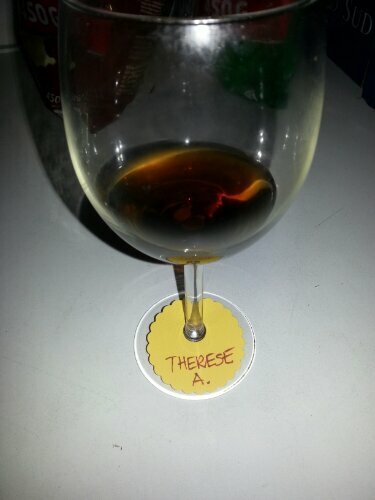 I also cut out these wine glass tags with my Big Shot, both orange and yellow paper and my mother added all the guest’s names on them. 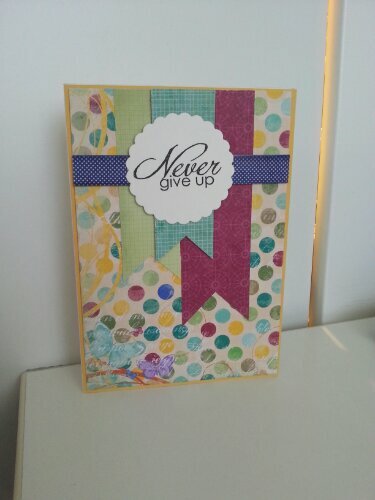 Inspired by this week’s Sweet stop sketch challenge #203 I made this card for my mother. 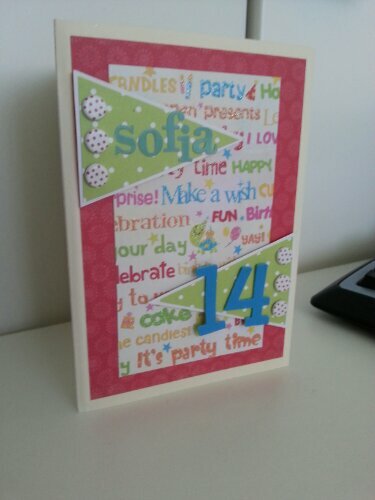 I really like the card but I don’t think it is a birthday card. Unfortunately I had no time to make another one before the party started. The text is a song in swedish about a girl named Maja, which also is my mother’s name and she used to sing it for me when I was a kid.